If your old tent canopy is worn, torn or faded, replace it with a new canopy in either gleaming white or a variety of colored stripes. This replacement canopy top is made of 15-oz laminated 'Black Out' vinyl to provide your guests complete protection from sun and rain. The canopy is anchored to the frame with two-inch seat belt webbing around the perimeter. This item is so sturdy that it will withstand many uses without damage. Note: This item is only the replacement canopy. 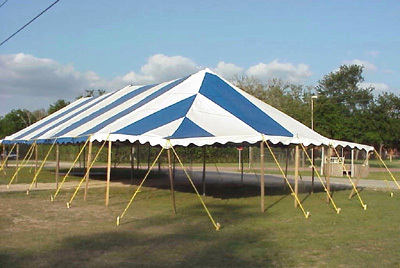 For complete tent packages see the Party Tents area of the website.